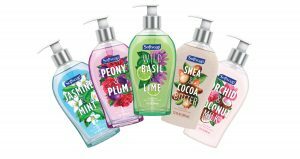 NEW YORK — Softsoap has re-launched its collection meant to bring style and happiness to washing your hands. The Décor Collection features five lavish scents with new reimagined, modern product packaging that brings a sophisticated pop of color to any sink in the home. The scents include, Wild Basil & Lime, Shea & Cocoa Butter, Peony & Plum, Orchid & Coconut Milk, and Jasmine & Mint. Consumers wash their hands and perform tasks at the kitchen and bathroom sink every day. The Décor Collection from Softsoap is meant to visually create small moments of joy while at the sink and the curated fragrances help produce a happy atmosphere for consumers while they carry out otherwise mundane tasks. 86% of Americans agree that decorating their home brings them joy and 69% of Americans wish they could add more joy to their bathroom.1The Décor Collection® from Softsoap is a great accessory to decorate with and can easily beautify the space around the sink. Softsoap has partnered with Joy Cho, Founder and Creative Director of the lifestyle graphic design studio, Oh Joy!, to further celebrate the relaunch of the Décor Collection. Softsoap and Joy are collaborating to create styled moments around the sink to visually encourage happiness and make washing your hands more enjoyable. The Softsoap Décor Collection is available for recommended retail price $2.97 (13 fl oz) and available at mass retail, drug and grocery stores nationwide.